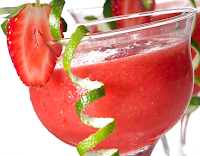 Fresh Strawberry Juice Recipes and Special .Juice is a drink which is always a favorite for the upper class people began to lower classes, ranging from the elderly to the children. The juice can be present at any time according to your taste, you can also enjoy it anywhere. Lots of traders fruit juice at this time, usually traders nogkrong in front of the mini market, malls, kiosks, curbs, making it easy for you to find it. The juice has a lot of variants, especially fruits with different flavors and different colors that make people keen to enjoy it. One fruit juice which we will discuss this time is the strawberry fruit juice. Strawberry juice drink is fresh and tasty and has a gorgeous color is pink. To enjoy the juice does not have to buy it, you can make it at home, especially if your home has a blender, it is simple and easy. When you buy juice, you often see a way to make it. That you can do in your home as you see when you buy juice. Easy is not it? Let us just for the juice is tasty and fresh strawberries. 0 Komentar Untuk "Fresh Strawberry Juice Recipes and Special"